It's almost Christmas in July! And if you've been hanging around this blog for any length of time you'll certainly recall what that means... SUGAR NUTS. Christmas in December, July, September or August only means one thing in my book. 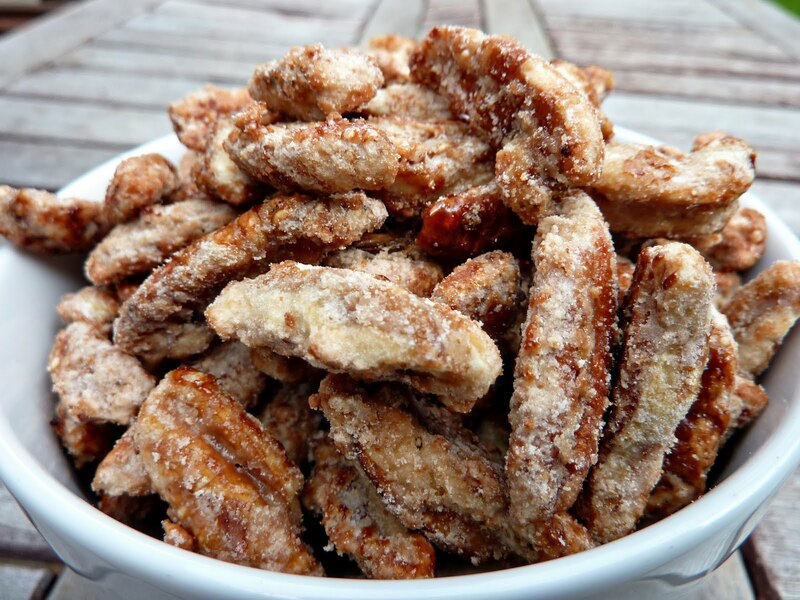 Remember those out-of-this-world Burnt Sugar Almonds I fell in love with last December? They were so good I found myself making a batch every other day for every reason I could think of... teacher's gifts, neighbor's gifts, gifts to myself for going through all the hard work of making them. I promised myself that this would be a holiday tradition only, so to minimize the need to buy increasingly larger pant sizes as the year carries on. I am proud to say that the sugar nuts have maintained their proper position until now—sugar and nuts, sitting separately in their respective positions in the cupboard. Until now that is! 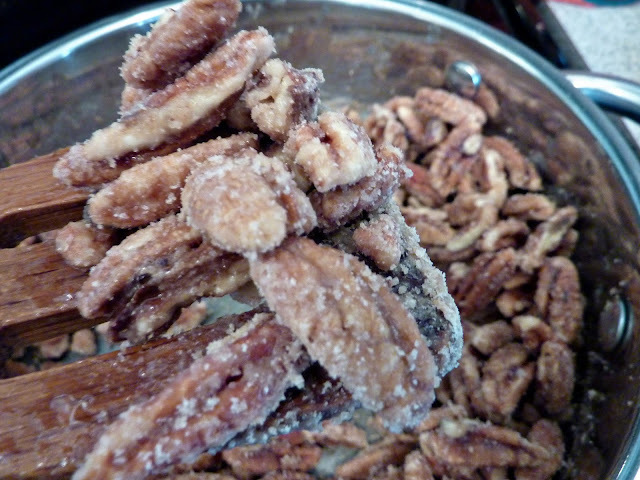 Christmas in July is a great reason to sprinkle sugar nuts on salads, over ice cream sundaes, or mix them in with the gorp as a special surprise for the kids. This recipe is so easy and so good. Give it a try and I guarantee you'll be happy you did. 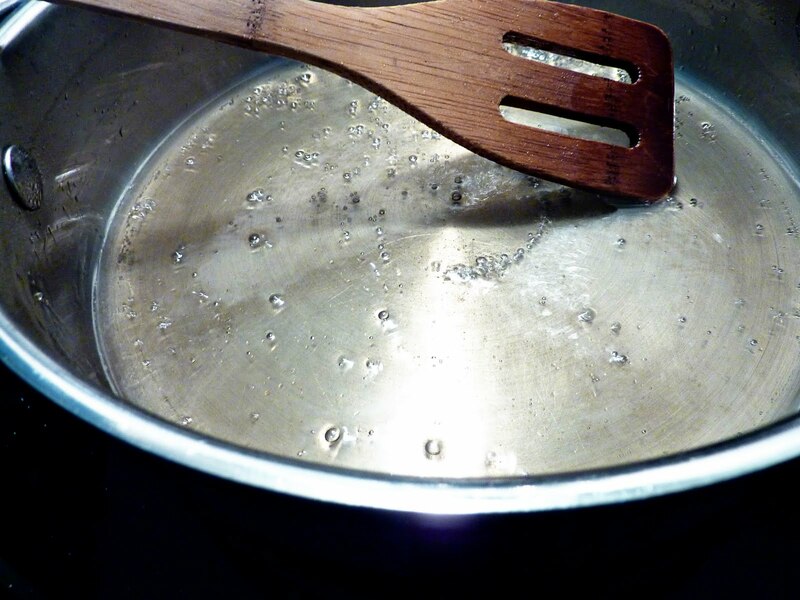 Combine sugar and water in a heavy saucepan over medium-high heat. Stir until all the sugar has dissolved. Pour in 2 cups of the halved and halved again pecans. 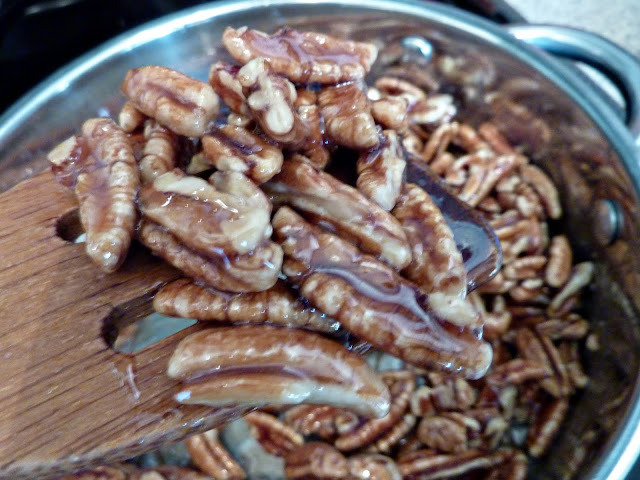 Still over medium-high heat, stir the pecans to coat them well in the sugar syrup. 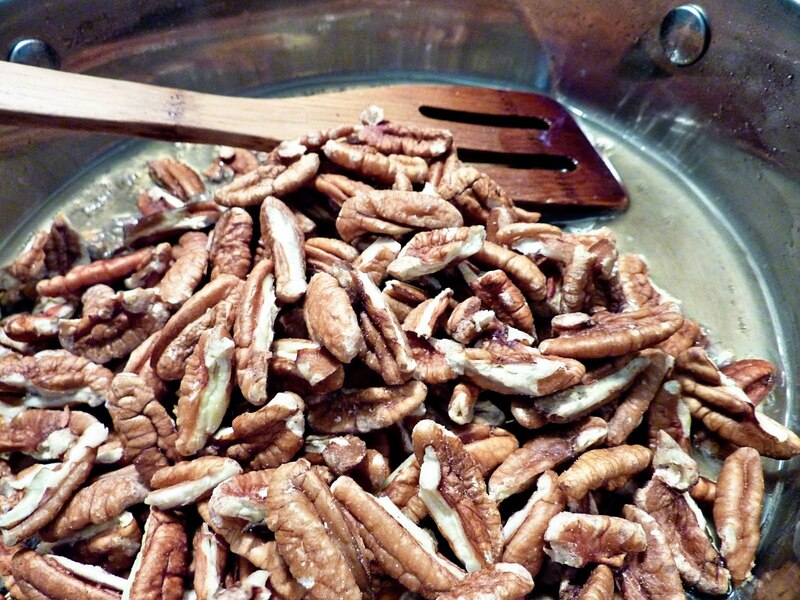 Continue stirring the pecans. Don't stop stirring. You will see the syrup turn into a dry crumbly coating over the nuts. This is good. Very good. Keep stirring. After a few more minutes watch the crumbly coating begin to melt back into a liquid. 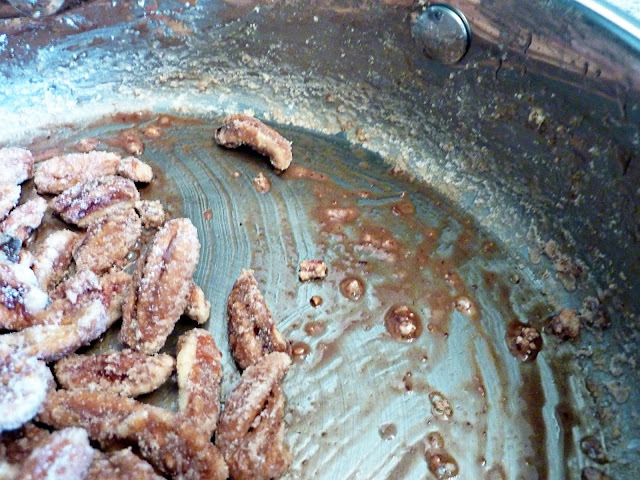 Keep stirring as the thick liquid coats the nuts slightly. 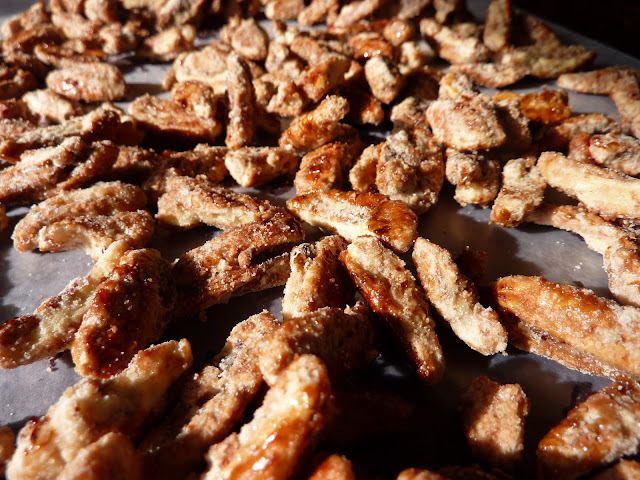 The batch is finished when the nuts are slightly shiny—but mostly bumpy—in appearance. Immediately spread onto a piece of wax paper to cool. Try not to eat them all in one sitting, my friends!